Imagine a group of friends having a picnic on the edge of the bush. You see adults sitting around, talking, and looking out over the natural vista. Their kids, however, are digging up the earth and crawling through the bushes, exploring. Most of the parents won’t be very keen to get grubby with their children, but there’ll always be a few who, no matter their age, will see the bush and dive in headfirst. For Annika Romeyn it’s this scene which expresses the opposite ways in which we interact with the landscape. The more ‘refined’ perspective on the landscape is certainly one which has dominated art for centuries, divorcing the viewer from the environment, transforming a vast and complex world into an object to be captured and recorded. 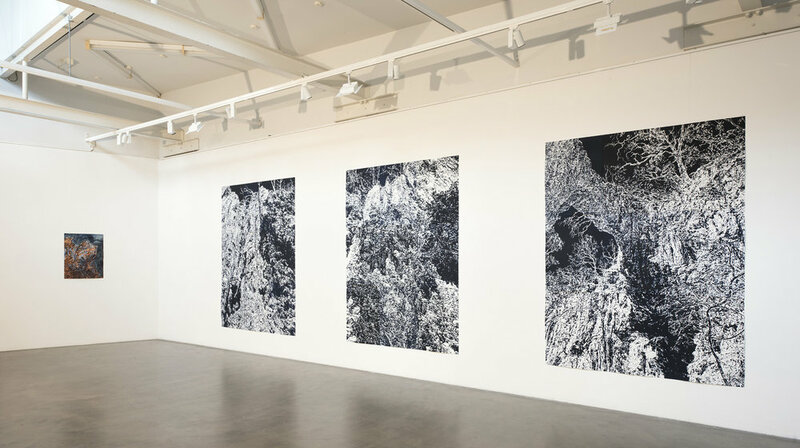 It is the alternative view, in which the artist immerses herself in the environment and shows us the Earth as it moves, grows and crumbles, which has inspired Annika to create the works in her latest exhibition, Precipice, a series of prints, drawings and watercolours of Golden Gully at Hill End, NSW. 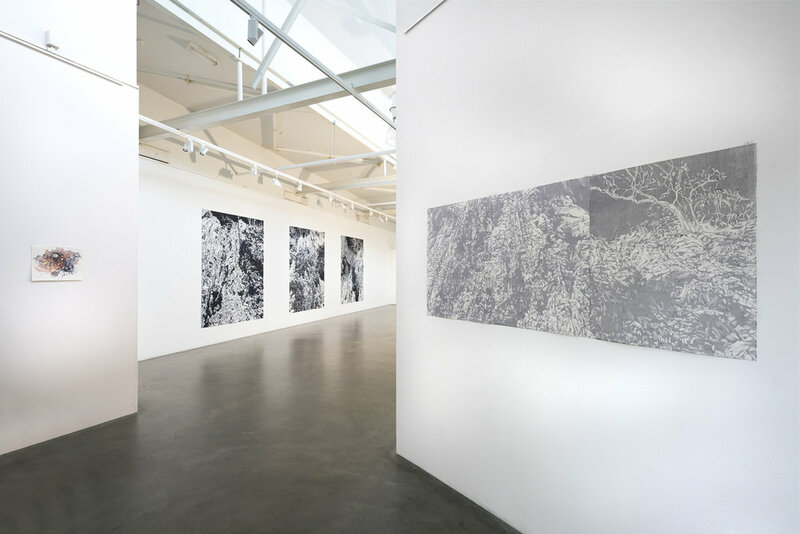 Developed following her time spent at the Bathurst Regional Gallery Hill End Artists Residency, Precipice is dominated by six colossal monoprints, depicting the eroded earth in surreal, almost abstracted shapes, cast in vivid black and white. The artist likens this to shards of light and voids of darkness, from which the form of a gully emerges. One can imagine standing at the bottom of Golden Gully, with your nose against the crumbling wall, dwarfed by those soaring cliffs. Annika’s intention is to make us experience this landscape in the same way she did, taking us to the bottom of the gully and showing us what it feels like to inhabit it. Perhaps the images which are most successful in this regard are the evocative ‘ghost prints’ which face off against the more traditional monoprints. These three works are faded second-run prints worked into with further sketches of the landscape - twisted trees and scattered bark, crumbling sand mounds and broken pebbles. The choice to treat the artwork in this way is one that Annika explains was a direct response to the way she saw the environment, scarred by the gold mining boom of the nineteenth century. The landscape of Hill End is pockmarked with mines, and Golden Gully itself would not exist without the abrasive methods used by prospectors one hundred and fifty years ago. It’s a landscape of constant change, as the gully deepens every year through erosion, trees clinging to the sheer edge before more sand is washed away and they tumble to the gully floor. It’s a landscape mutilated by man, used as a metaphor for grander concerns at play as we mine the earth, denude forests and drain rivers across the globe. Annika subtly hints at the risks, and consequences, of such unchecked consumption. 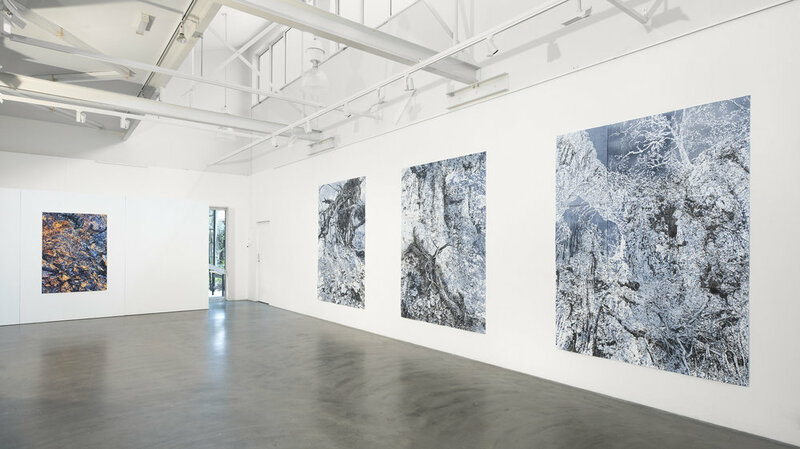 She explains the title of the exhibition, Precipice, is not only a literal reference to the edge of the gully, but also the ecological tipping points we face in the world today as our precarious position on the planet teeters on the edge, not unlike the delicate balance of the gnarled gumtree above Golden Gully. Despite showing us the destructive capabilities of man there is an undeniable beauty which pours through the works. Annika explains that some of the most impressive landscapes are those that are the least inviting, having spent time recording the vast spaces of the Franklin River and Grand Canyon. This balance between finding beauty in the harsh regions of the world has been a driving force in Annika’s burgeoning career. In fact it was an unforgiving Antarctic landscape, found in the work of Jörg Schmeisser, which first drew Annika to printmaking. 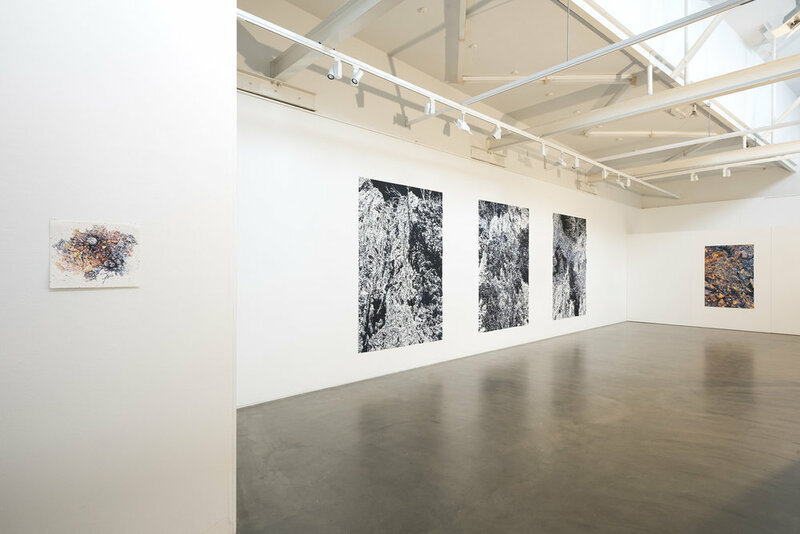 While the prospect of an expedition to the frozen continent still tantalises the artist, she continues to explore the places closer to home that inspired her favourite artworks. Indeed, it was Russell Drysdale’s work at Golden Gully, depicting a warped and alien landscape, which sparked her interest in the Hill End region. Sequestered in Murray’s Cottage for a month, Annika took the opportunity to find her own response to a landscape that has attracted not just Drysdale, but Jeffrey Smart, Margaret Olley and many other artists over the years. Standing amongst the canopy of this artistic heritage, in a place so distorted by the actions of man, Annika has achieved a brilliant and unique approach in recording the landscape. She has captured its raw beauty in a way that both examines and transcends the damage that so vividly defines it. The ghost prints, with their faint bruised background, mixed with black and blue ink, stand as an evocative view of Golden Gully. Precipice truly is an artist’s perspective that is both literal and taps into the visceral feelings this place conjures.